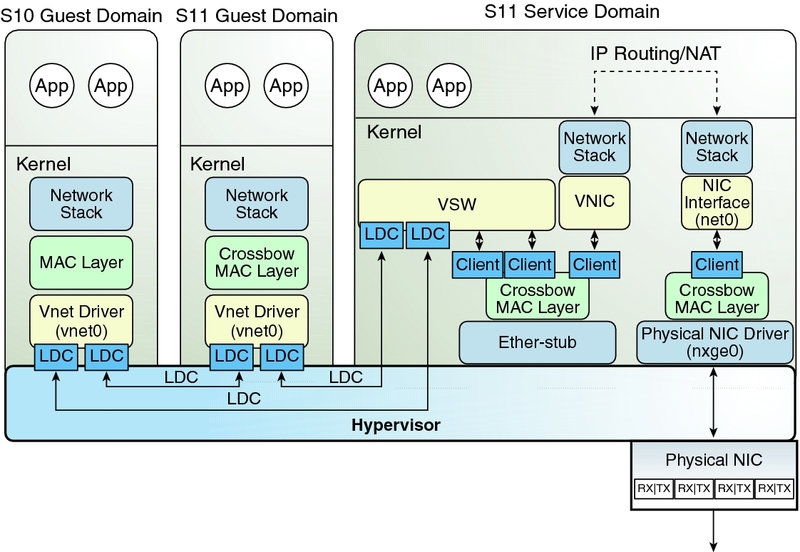 The Oracle Solaris 11 network virtualization features include etherstub, which is a pseudo network device. This device provides functionality similar to physical network devices but only for private communications with its clients. This pseudo device can be used as a network back-end device for a virtual switch that provides the private communications between virtual networks. By using the etherstub device as a back-end device, guest domains can also communicate with VNICs on the same etherstub device. Using the etherstub device in this way enables guest domains to communicate with zones in the service domain. Use the dladm create-etherstub command to create an etherstub device. The following diagram shows how virtual switches, etherstub devices, and VNICs can be used to set up Network Address Translation (NAT) in a service domain. You might consider using persistent routes. For more information, see Troubleshooting Issues When Adding a Persistent Route in Troubleshooting Network Administration Issues in Oracle Solaris 11.3 and Creating Persistent (Static) Routes in Configuring and Managing Network Components in Oracle Solaris 11.3. Create an Oracle Solaris 11 etherstub device. Create a virtual switch that uses stub0 as the physical back-end device. Create a VNIC on the stub0 device. Configure vnic0 as the network interface. Enable IPv4 forwarding and create NAT rules. See Customizing IP Interface Properties and Addresses in Configuring and Managing Network Components in Oracle Solaris 11.3 and Packet Forwarding and Routing on IPv4 Networks in Oracle Solaris Administration: IP Services.